My name is Pat Griffiths and I am studying the Master of International Relations (Advanced). Why did you chose to study this degree program and what made you choose ANU? Blame Kellogg’s. It’s all because I pulled that ‘Age of Empires’ computer game demo out of a special promotion Nutri-Grain packet and fell in love with ancient history. That’s the nerdy origin story. But really… I felt a strong desire to continue learning in an academic space after finishing my undergrad, and have always been fascinated by history and contemporary politics in and beyond Australia. With its focus on the intersection of history, culture and politics, a Masters in International Relations at ANU became a pretty clear choice. I’ve always been curious about Australia’s place in the world, so I chose ANU because of its proximity to government in Canberra and its high international rankings. 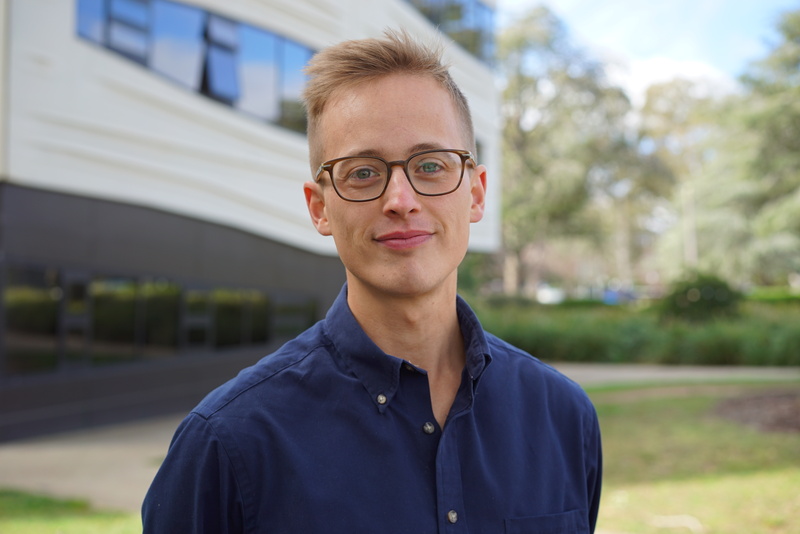 I chose the Master of International Relations because the department at ANU is the first of its kind in Australia and I wanted a degree that would complement my undergraduate studies in journalism. The program encourages curiosity in understanding and applying theory to real-world challenges, which held strong appeal for me. I’m glad I made the decision, it’s been paying dividends ever since. What was your undergraduate study? Did this influence your decision in pursuing your current postgraduate program? I studied an undergraduate double-degree in journalism and international studies at the University of Technology, Sydney. The international studies aspect of the degree had always been the real attraction for me but I wanted to tie it to something more practical - so I chose journalism. I’m pretty glad I made this decision since the course was incredibly practical and embedded within the media industry. It led to opportunities to work with the ABC and News Corp Australia as well as community media outlets like 2SER. On the international studies side of things, I spent one year of in-country study at Zhejiang University in Hangzhou, China in 2015. Learning Mandarin coupled with widespread travels through China and northeast Asia made for one of the most memorable years of my life. My undergrad studies cemented my passion for journalism and kindled a strong interest in exploring further avenues regarding international relations. A Masters in International Relations at ANU offered the natural next step for the welcome collision of journalism and international studies from my undergraduate years. What are some of the skills that you’ve learnt in this program? One of the great things about the Master of IR program is the ability to tailor it to your own specific interests. If diplomacy is your jam, there are electives to match. If global security is your cup of tea, same again. Whether by region, topic, perspective or method, there are courses available - some dipping into the shared brains trust of academics from different master’s programs. Two standout courses for me were International Relations Theory (IRT) and Making Foreign Policy (MFP). Seemingly at opposite ends of the spectrum between abstract and concrete, in combination they were actually great a complement to each other. When IRT seemed frustratingly far from reality, MFP was never too shy to examine the real consequences of decisions in the here and now. Likewise, when analysing the psychology of Donald Trump in micro seemed too short-sighted, IRT was always there with a handy theoretical framework. Overall, the Master of IR develops the ability to think critically, communicate complex ideas, and apply theory to practice – these are takeaways I’ve definitely come to appreciate. Where do you work currently and how have the skills you’ve learnt in the program helped you in the work place? Since moving to Canberra last year, I’ve been lucky enough to find work that combines my interest in both journalism and international relations. I work as a journalist with the Australian Associated Press in the Canberra Press Gallery when parliament sits, and help out in the Bell School communications team when parliament is adjourned. Working at parliament has given me the opportunity to talk to and write about key decision-makers in Australian foreign policy. At the same time, it’s been an incredible privilege to both study and work within the Bell School - I feel pretty lucky. Being taught by some amazing academics, and then being able to interview them about their own research has only fuelled my interest in international relations. In that way, my work and study have turned out to be mutually beneficial. To combine journalism and international relations is to combine the 24-hour news cycle with forward thinking, instant reportage with long-term analysis. What I learn from my masters degree feeds into and informs my journalism, and vice versa. What’s more, it seems to generate more opportunities, to open up doors in both directions. I’d recommend the combination to anyone wondering how to move from the theory of a Masters in IR into professional practice. Tell us about your experience studying at ANU and living in Canberra. Hey, I love Canberra. Everything I need - uni, work, food, lake, mountain - is within a half hour’s cycling radius. However, a true highlight for me has been how friendly and approachable the people of the Bell School are. I’ve really appreciated how generous the academic and professional staff alike have been with their time, to share their research or take questions. That’s been a huge factor in the extent to which I’ve enjoyed this Masters program. While essential services are never far away in Canberra, it’s also pretty easy to escape the city (there’s not much of it) and I’m a big fan of how green the ANU campus is - a river runs through it! It’s a pretty strong contrast to my undergraduate university, UTS, which was smack-bang in the middle of the CBD. I appreciate the difference.